● Sign up for the email newsletter in order to receive news of deals and offers as well as impending product releases. ● VistaPrint offers a 100% Satisfaction Guarantee whereby if you are dissatisfied about your purchase, you can contact customer service in order to have a representative rectify your VistaPrint experience. ● There is a low price guarantee available for purchases of postcards, business cards, folders, and brochures. If you find a lower price for an identical product available with another retailer, you can notify VistaPrint within 3 days of receiving your order to procure a refund of the difference. 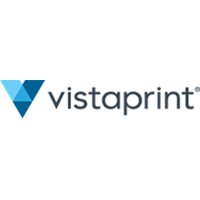 ● VistaPrint offers flat rate shipping for varying delivery time lengths. Vista Print customers are going to be able to take advantage of inexpensive printing rates to have all of their business printing needs taken care of. Business cards, invitations, proposals, stationery, etc. are all going to be able to be custom printed using the service that this company offers at rates that simply cannot be topped. Not only that, but this company also provides free samples for all of the different printing projects that they make available, allowing customers to actually put their hands on the finished product before they click the purchase order button. They have a rewards program in place that allows long-term customers to earn deep discounts on every order. For most up to date offers check out Vistaprint.ca on Facebook and Twitter or contact Vistaprint.ca Support for any questions.